What do septic tank cleaning and sprinkler systems have to do with each other? 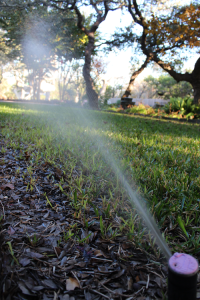 Usually nothing — unless sprinkler lines are installed over or near your septic tank. This is not necessarily an issue, but it does raise the risk of causing damage to the sprinkler lines as the tank lid is located and exposed. Most of the time we can dig around sprinkler lines and avoid damage while locating and removing the septic tank lids, but because those lines are buried sometimes we don’t find them until after they’ve already been damaged. In situations where we discover sprinkler lines over a customer’s septic tank, we recommend that either those lines be re-routed, or that the customer install risers over their tank’s lid (septic tank risers eliminate the need for digging to reach the tank’s lid) to prevent damage during future septic tank maintenance. If you are planning to install a sprinkler system on your property, it is wise to mark your septic tank’s location for the installer and ensure they do not install sprinkler lines in that area. We also recommend that you clearly mark your septic tank’s lids so they can be easily located by your maintenance provider. Careful use and proper maintenance of your septic system is critical to its longevity.